The U.S. version of all 107 chassis convertibles and coupes had identical twin round sealed beam headlights mounted side by side (similar to the 116 chassis). The car looked much better with European headlights as shown above and these remain a popular upgrade/conversion even today. The 107 chassis was Mercedes first V8 SL. Throughout its entire 18 year production it was available as a 2 seat convertible with removable hardtop. 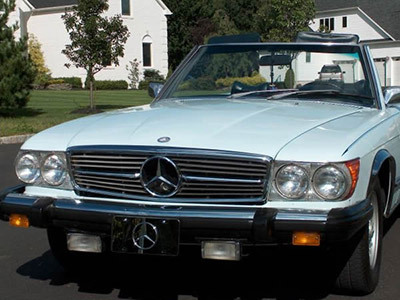 From 1973 to 1981 it was also available as a 2+2 two door coupe as an SLC. It was a far more bulky car than its lithe predecessor , but also had many more creature comforts. Air-conditioning was now standard, and automatic transmission was standard on American cars. Over the years the engine displacement varied, but the basic shape never changed during production. Only some detail changes were made to the interior and exterior. The most drastic change occurred in 1986 when 560SL was introduced in the USA. Some changes to the chassis and suspension were made to the 560 that can not be retrofitted to earlier models. Begin with the "back end" fuel delivery system first. What is the best glove for working on your car? Tips on how to make the gloves last longer!